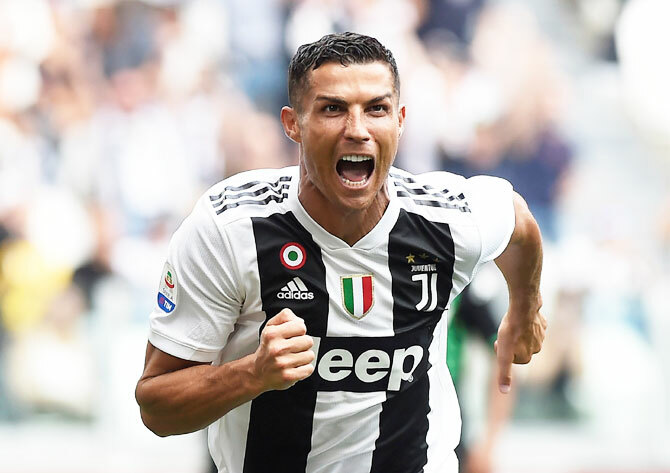 Cristiano Ronaldo broke his Juventus duck in his fourth game when he scored a brace on Sunday to give them a 2-1 win over Sassuolo in Serie A, although the Turin side's day was marred by a red card for Douglas Costa for spitting at an opponent. The five-time world player of the year opened his account in the easiest possible fashion by tapping into an empty net from less than two metres in the 50th minute, then finished off a counter-attack 15 minutes later. The Brazilian escaped with a booking for elbowing and then head-butting his rival as they tangled before the Sassuolo goal, but was then sent off after cameras caught him spitting at the same player in another altercation. "I was a little bit anxious as expectations were high," said Ronaldo. "I really wanted to score, so I'm happy." Sassuolo allowed Ronaldo few openings in the first half apart from an early shot which was blocked and a header which went wide from Alex Sandro's cross. He also tried his luck from a 30-metre free kick but sent a disappointing effort harmlessly wide of Andrea Consigli's goal. Ronaldo's luck changed when Sassuolo defender Gian Marco Ferrari headed a corner onto his own post and the rebound left Ronaldo with the easiest of tap-ins. Ronaldo could easily have had a hat-trick but missed two more good chances and also had a penalty appeal turned down. He volleyed wide from an unmarked position six metres out and also failed to hit the target when the rebound landed at his feet as Joao Cancelo's shot was saved by Consigli.